This week has been a tough one for me, emotionally, as we learned that Moscow has suspended adoptions for one month, until regulations which allow Russian officials to better monitor adoptions are put into place. At least that's how I understand it. To be honest, I get it. There have been some terrible, terrible stories in the news over past few years about adoptive parents abusing their children and even, in one case, sending a son back to Russia on a plane with a note of rejection pinned inside his jacket. That is unacceptable. The Russian government wants to prevent this from happening and I absolutely agree. At the same time, it awakens a sense of fear in me. It reminds me how very much not in control of this adoption I am. It is an unsettling feeling. I've heard other adoptive parents talk about the bumps and the long wait of adoption and say things like, "I prayed that God would hurry the process up, but he didn't because he had to teach me something during the wait." I could be wrong, but I just don't think this kind of stuff happens so that God can teach us a lesson. I don't think John and I had to survive a long distance marriage for over a year because God had to teach us something. I don't think God had my family endure my mom's long near-death illness to teach us something. And I don't think God allows the adoption process to be so long and hard in order to teach us something. I think those things happen because we live in a fallen world with lots of brokenness and sin in it. Our son is living without his birth mother because of brokenness. He is waiting in an orphanage because of the fall. We can't get to him tomorrow, even though we'd get on a plane in 20 minutes if we could, because the world is not as it should be. That's why these things happen. Not because God wants to teach us something. I also believe in the power of a teachable spirit. No, God is not causing this bump and all this worry and fear in our adoption journey so that we'll learn a lesson. But, if I put on a teachable spirit I believe he will use this journey to teach me something. Or lots of things. I see this kind of teachable spirit in Joseph who says to his brothers in Gen 50:20, "You intended to harm me, but God intended it for good to accomplish what is now being done, the saving of many lives." And of course in the popular verse Romans 8:28, "And we know that in all things God works for the good of those who love him, who have been called according to his purpose." I'm sure that God did not delight in the sin that caused Joseph's brothers to sell him as a slave. Or in all the disease and hunger and thirst which causes the entire creation to groan in pain and suffering. And I don't think he is satisfied with an adoption process that allows children to wait for months and years in orphanages without families. Somehow, though, he is working it out for good. That's a leap of faith I take as a Christian. Some days I feel like I'm making the jump with the strength of my own legs. And other days (like the day when I found out Moscow's suspending adoptions for a month) I realize that I'm only making the leap because the Spirit's been carrying me on eagle's wings. So now, in the face of a potential roadblock, I pray for a teachable spirit. I pray that in the face of all my inability, I will learn to rest in God's ability. That I will learn to believe that when I can't hold my son, God will. That when I can't wipe his tears, God will comfort him. That when I can't enjoy his laughter, God will take delight in it. And even that when I can't figure out how to fill out that next adoption form, or remember where I put all those photocopies of my birth certificate, or figure out which social worker at what agency I need to call in order to figure out the answer to a question I'm not even quite sure how to ask- that God will give me the wisdom, the strength, and the clarity to move forward. Day by day, hour by hour, minute by minute, form by form, question by question, and pen stroke by pen stroke. God is able to make me teachable in my inability. God is able to use this bump in our journey to teach me to trust in him, even though he is not the author of the sin and brokenness that has caused it. I pray he also ends the suspension ASAP. I really want to get to my son. Of course the "getting to our son" journey also depends on buying those plane tickets! John and I owed less than we saved for our taxes this year which means we got to fill up our fundraising thermometer something to the effect of $3,000! Praise God! We're getting closer to our goal! Remember to check out our auction and bid on some sweet stuff like a family photo session or a cozy sweater or a set of five whimsical pennant banners! We also have our tshirts for sale! My sister and sister-in-law designed these incredible shirts and local printing company Sonscreens gave us a generous deal to print them! Thank you Jenna, Kaitlin, and Sonscreens! It takes a village to ADOPT a child! Available in NAVY: women's V-neck or unisex crewneck. John and I are electrically aware of the fact that we could not do this alone. It is a fact that both humbles us and hold us up. 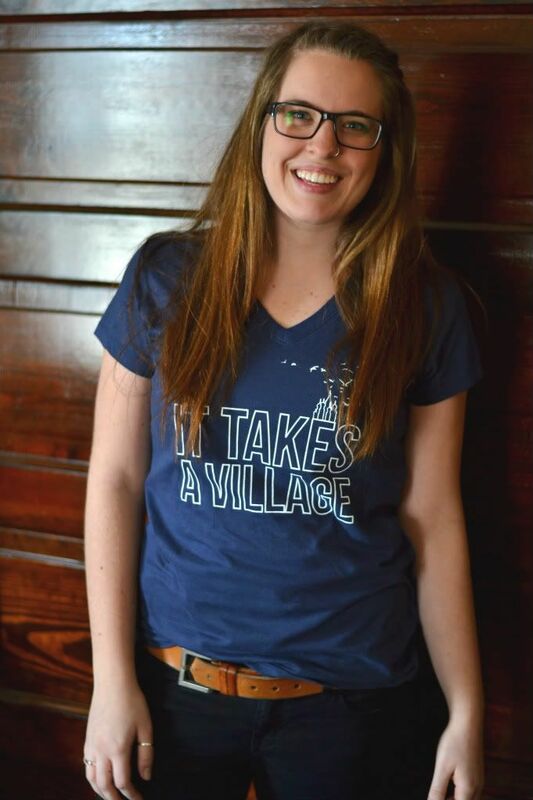 For everyone in our village, whether you've been praying, sending us encouraging messages/emails/texts, donating, buying coffee or a card or a necklace, whether you're planning on coming to our breakfast, whether you read my blog, or if you're going to buy this shirt: you're our people and our son could NOT come home to us without you. The "village" sitting on the "E" is a nod to the gorgeous St. Basil's cathedral in Moscow. We hope you'll wear this design with pride. The second design is by my sister-in-law Kaitlin and warms my heart. Though I haven't yet learned the Russian alphabet (but plan to! ), the Cyrillic lettering already has a very special place in my heart. When we started this adoption I didn't know how much I would come to love Russian culture. I find myself wanting to learn everything I can about this country that holds our baby boy. I haven't even been there but Russia already has my heart. 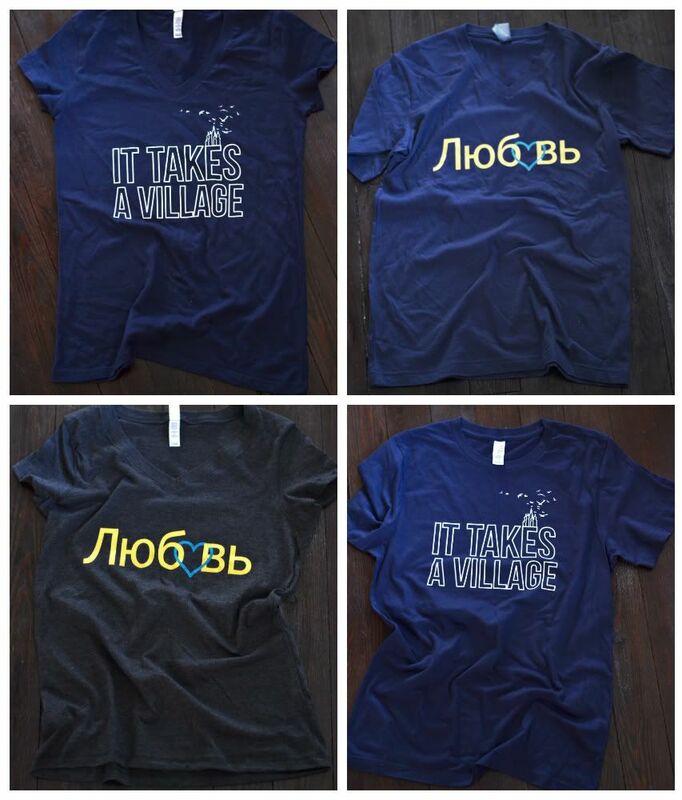 Available in Men's NAVY v-neck, women's CHARCOAL v-neck, or unisex CHARCOAL v-neck. The shirt simply says "love" in Russian and the letter "o" looks like a heart because Kaitlin loves any excuse for a heart. And so do I! You can you can see available styles and sizes at my etsy shop where of course you can also purchase a shirt! And you can also purchase one by messaging/emailing/leaving me a comment or grabbing me in person! Shirts are 100% cotton and $20 each. In stock sizes will be available right away for shipping or pickup and out of stock will be available in 1-2 weeks. We can't wait to see you sporting these shirts for our baby boy! I am still appalled by Putin's signature on such bill that would prohibit American families to adopt or sponsor a child. It is politically motivated. In reading your post, I must say that I got a sigh of relief. There is no political divide here, no conflict but all that is goodwill. I hope that Russia and the United States would one day settle any diplomatic tensions and work for the better good on which UNICEF is doing for many years. 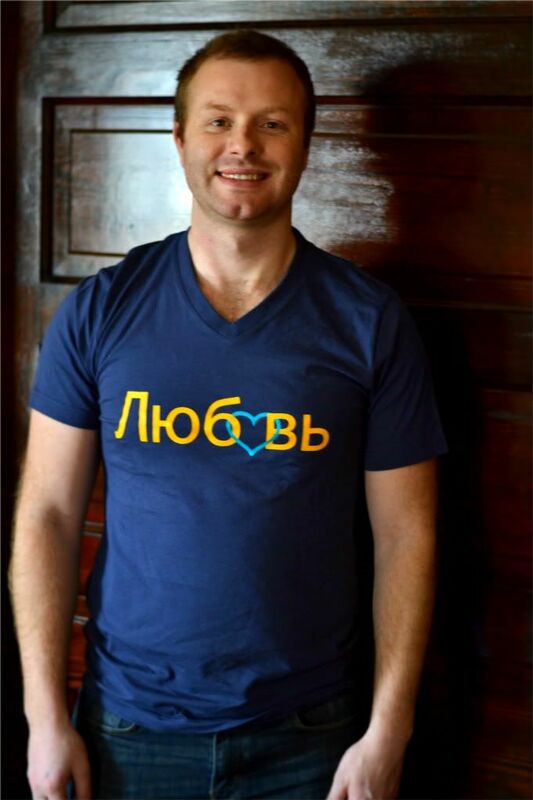 I went to the etsy shop and seeing as this was a long time ago, i see you don't have the Russian "love" shirts any more... any chance there are still some lingering around? This has a very special personal meaning to me, and it would mean so much if you had any way of helping me get one.